A BLISTERING opening half from West Coast set up a crushing 68-point win over Richmond, a result certain to send the Tigers into further turmoil. The Eagles celebrated the 30th anniversary of their first VFL game on Friday night in style, winning 18.17 (125) to 9.3 (57) at Domain Stadium. The game was played almost exclusively in the Eagles' forward half in the opening term, as their pressure and precision ball use punished the Tigers time and time again as the visitors failed to run it out of defence by either hand or foot. "We wanted to bring a lot of pressure to the game," Eagles coach Adam Simpson said post-match. "We know teams that travel here really want to start well. That was a really important part of the game for us, to bring that pressure. We backed up with some contested ball. We got some good supply." Richmond managed just eight inside 50s in the opening half. It was only the fourth time a team had been kept to single figures for inside 50s in an opening half since 2000. By contrast, West Coast had 36 inside 50s and 23 scoring shots, and only the Eagles’ inaccuracy kept the half-time margin to 54 points. Richmond lost the contested possession count by 22 in the first half. "It all came down to contested ball," Richmond coach Damien Hardwick said. "We were well beaten around the contest and we know how important clearance is against West Coast, especially early doors. "We just battled in that area and then we couldn't get the ball out of defensive 50. "They were just too good in all facets of the game." The home side lost star midfielder Matt Priddis pre-game due to a groin strain, but his absence was hardly noticed. Andrew Gaff (33 disposals and four score assists) and Luke Shuey (22 disposals and two goals) ran riot in the midfield. 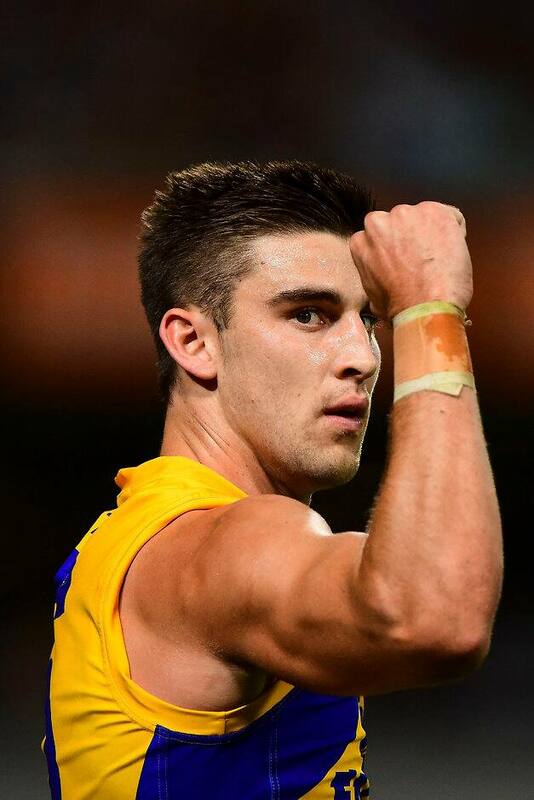 Jack Darling kicked four goals and Elliot Yeo had a night out with 25 touches, nine marks and 2.4. Alex Rance fought bravely in defence against Josh Kennedy, winning the majority of the one-on-one battles and collecting 26 disposals and 11 marks himself. Jack Riewoldt played a lone hand up forward kicking four goals from limited opportunities. The Tigers struggles were compounded with an injury to Shaun Hampson. He came into the game as the main ruckman for the Tigers after Ivan Maric needed more game-time in the VFL. Hampson copped a heavy cork to his left thigh and struggled to move in the second term before sitting out the second half. Nic Naitanui and Scott Lycett dominated the ruck all night as a result and it allowed the Eagles to play the game on their terms. Lycett will face a nervous wait this week after being reported for striking Ty Vickery. The Eagles’ big man engaged in some push and shove, but landed a left jab on Vickery's chin that is certain to be heavily scrutinised by the Match Review Panel. West Coast: Brownlow medallist Matt Priddis was withdrawn pre-game due to a groin strain. "We wanted to give him every chance," Simpson said. "I wanted to give him another 24-hours. He's a bit tight in the groin - more than tight in the groin." He hoped Priddis would be right to face the Sydney Swans next week. The Eagles escaped without any other concerns. Richmond: Hampson suffered a heavy cork to his left thigh in the first half and spent the entire second half on the bench with ice strapped to his thigh. David Astbury rolled his left ankle in the last quarter and had to be helped from the ground. "We’ll have to wait and see (on both)," Hardwick said. "I think Hampson got an early knock to his thigh and another one I think in the first contest after the quarter-time break. So he's probably in a bit of doubt at this stage. Dave I think has got a significant ankle strain. How serious it is I'm not too sure." The Eagles travel to Sydney for a blockbuster with the Swans next Saturday afternoon at the SCG. The Tigers face Melbourne in a must-win match at the MCG on Sunday night. Reports: Scott Lycett for striking Ty Vickery in the second quarter.